One of our all time favorite dishes and it’s so easy to make. 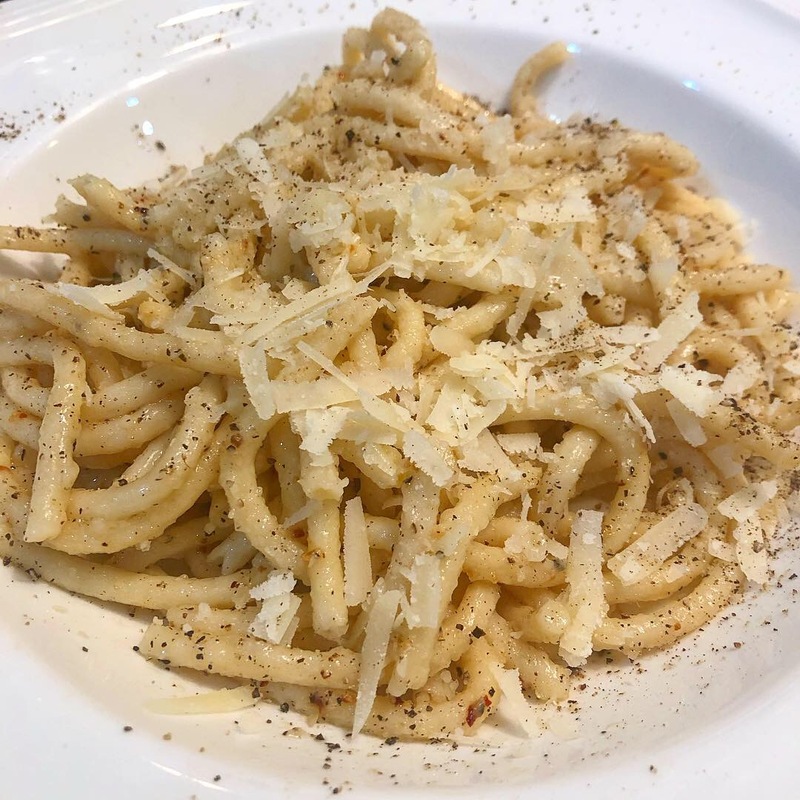 Cacio e Pepe (Cheese and Pepper). It’s that simple. For this recipe you use the simple trick of ladling in pasta water to your pasta to create a creamy sauce. The starch from the pasta water will help the cheese and pepper to coat the pasta. > Homemade Spaghetti – Pasta dough comes in many variations but is mostly made of flour and eggs. For every 100g of flour you add an egg. One pound of pasta is approximately 500g of flour and 5 eggs. We mixed Semolina and white flour with a pinch of salt and a tablespoon of olive oil for this batch. You may find that you don’t need as much flour or you need more flour and that’s ok. If you live in a humid climate, the flour in your house will pick up moisture through the humid air and you’ll find that you need less eggs to bind your dough. Let the consistency of the dough tell you when it’s ready. 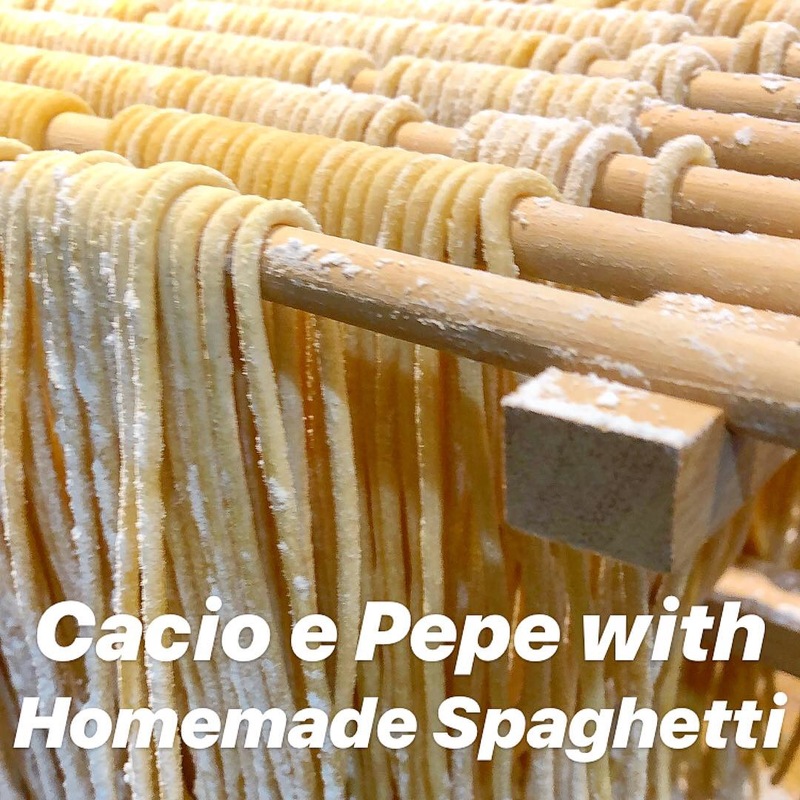 If you feel you have enough flour mixed in to start rolling the pasta, press your thumb into the middle of the dough ball, if it comes out clean you have enough flour, if it’s still gummy and sticking to your thumb you don’t have enough flour. Knead until you have a smooth consistent dough. Roll it thin and cut into thin strips, or follow the instructions for a pasta extruding machine, if you have one. Use excess flour to toss your fresh pasta in to keep it from sticking. Bunch it into nests, or hang like our picture below. altier than sea water. Cook your pasta to Al’Dente. Heat 3tbsp of butter per pound of pasta in a skillet. Season heavily with black pepper. Add in your cooked pasta to the skillet. Add in a generous amount of Pecorino, Parmigiano, Parmesan, or Grana Padano Cheese. Quickly pour a few scoops of the pasta water and fold the pasta to make a sauce. Be careful not to add too much pasta water at once. Add one ladle at a time, you don’t want the sauce watery. Just enough to smooth out the cheese into a creamy consistency. Add cheese or pepper as needed. Serve and eat immediately and garnish with more cheese and more black pepper! 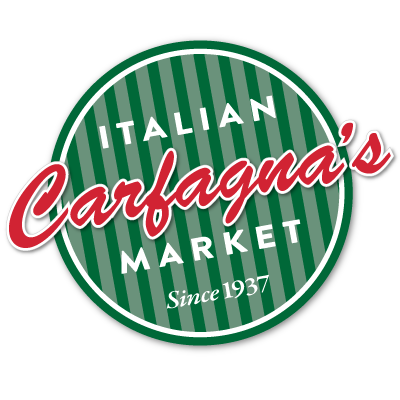 80 years is a long time and over the years there have been many of our recipes that have become part of the Carfagna family’s traditions. We share them here in hopes that some of them become traditions with your family too.